ALI TRAINER DUNDEE: MUHAMMAD . . .
LOUISVILLE – The phone calls from Muhammad Ali still come, about once a month, always early in the morning, before the demands of the day leave Ali fatigued. 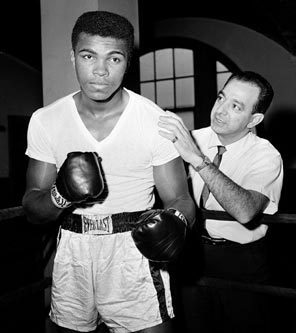 Angelo Dundee, the man who trained Ali to the heavyweight championship of the world, will eagerly reach for the phone and the two great men will reminisce. "I'll say, 'Me, too, kid. Me, too. We can't do that. But what I can do is make sure you know that I love you.' "
How do you say Happy 70th Birthday to The Greatest, the irrepressible Louisville native who dined with kings and danced to glory across the planet? If you are Angelo Dundee, you travel from Clearwater, Fla., to Louisville to proudly take your place as one of the 350 or so friends at the birthday gala for Ali at the Muhammad Ali Center on Saturday night — even if you are 90 years old and doggedly navigating downtown Louisville in a wheelchair. The Who's Who list of admirers traveled from across the country to celebrate Ali's birthday (which is Tuesday) and his remarkable legacy as a boxer, social activist, cultural icon, entertainer and courageous Parkinson's disease patient. There were heavyweights from the worlds of entertainment, sports and politics. But there were also family friends, like Louisville native Alice Houston, who serves on the Ali Center board of directors. She once lived two houses from Ali near 33rd and Grand in the West End. "To have been nurtured, developed, educated, initially supported and launched into the world by this community is something we should celebrate," Houston said. "He really is the embodiment of Possibility City to the Nth degree," she said, employing a term used to promote Louisville. There was Felix Rodriguez, who grew up without a father in a public housing complex in Waterbury, Conn., but followed Ali's story as inspiration, writing an award-winning children's book titled "Dad, Me and Muhammad Ali" in 2009. He was waiting in the Ali Center lobby for the celebration to begin early Saturday afternoon. "I wasn't born until 1975, after he'd fought most of his great fights," Rodriguez said. "But that didn't matter. His story became a role model to me, something I've always believed in along the way." The Ali story, of course, is as well known as any in sports, a story that makes Ali and Babe Ruth the two most iconic figures in American sports over the last century in the opinion of Bill Nack, who wrote multiple Sports Illustrated cover stories about Ali. Nack also argues that in boxing, Joe Louis, Sugar Ray Leonard and everybody else are fighting for second place. Ali is the greatest fighter of all time. He grew up in Louisville as Cassius Clay. Started boxing with the encouragement of policeman Joe Martin after somebody stole his bicycle. Graduated from Central High School. Won an Olympic gold medal in 1960 in Rome. Turned professional. Won the heavyweight championship — and then gave it up in 1967 after he had changed his name to Muhammad Ali, joined the Nation of Islam and refused military induction because of his opposition to the Vietnam War. "It was a powerful statement that he made," said Wade Houston, a Louisville businessman, who is Alice Houston's husband. "Muhammad showed the importance of standing up for your convictions." Ali returned to the ring in 1970 — and the legend kept growing. His three fights against Joe Frazier have long been considered the most remarkable trilogy in boxing. He beat George Foreman in Zaire in 1974, when nobody was supposed to be able to handle the mammoth Foreman. Less than three years after his 1981 retirement, Ali was diagnosed with Parkinson's, a neurological disorder that has drained much of his trademark vibrancy and unmatched ability to entertain. With the persistent support of his wife, Lonnie, Ali has maintained his commitment to humanitarian causes, a commitment recognized when President George W. Bush presented the Presidential Medal of Freedom to him in 2005. "His ability to maintain an active lifestyle and persevere shows tremendous resilience in the face of what is a degenerative brain disease," said Dr. David Houghton, an assistant professor at the University of Louisville who is co-director of the division of movement disorders and department of neurology. The resilience does not surprise Ali's friends and admirers. Persistence is one quality usually overlooked on his boxing resume. Resilience, and insistence by Dundee, kept him in the ring when he wanted to stop after the fourth round in his first title bout with the brutish Sonny Liston on Feb. 25, 1964. Somehow, a stinging chemical had worked its way into Ali's eyes, making him scream something about stopping when he got to his corner. Dundee convinced him it wasn't time for that. He won that bout — and then flattened Liston in the first round of their rematch. Resilience drove him to pursue the heavyweight title for nearly four years after Ali returned from his forced exile in 1970. Pretty boy obsessed with finesse? Hardly. Ali parked directly in Joe Frazier's face, where Nack counted that Ali took more than 400 left jabs in their third and final bout, the epic "Thrilla in Manila." "Because of all the things Ali did and said, some people thought he was just this big blowhard and they wanted to see him get his comeuppance," Nack said. "But what you should never forget is he backed it up. He was really a great fighter. He understood how to sell tickets, but even more than that, he understood how to fight. He was never afraid." You don't have to sell Dundee on any of that. The Ali that he knew was the first one to report to the gym and the last to leave, occasionally running seven miles across a causeway from his apartment to Dundee's gym in Miami Beach. The Ali that Dundee knew also would tie a string around the drapes in the trainer's hotel room, simply so he could jiggle them in the middle of the night to scare Dundee. The Ali that Dundee knew still makes those regular, early morning phone calls just so the two great friends can laugh about the wonderful times they shared. "Everything about this kid is great, and because I'm 90 years old, I can still call him a kid," Dundee said. "I can't tell you what a great time I've had with this kid. We've had a relationship that was as perfect as any relationship two men have ever had. He taught me how to be tough. He taught me how to be patient. He taught me how to be strong. "All he ever wanted to be was the best there ever was. And you know what? He did it."